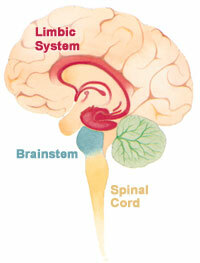 The physical home of emotion – the limbic area, is located in the center-region of the brain. The limbic system consists of a series of interconnected structures that include the frontal area, the hippocampus, amygdala, hypothalamus (anterior thalamic nuclei), septum, limbic cortex and fornix. It is believed that these structures support a variety of cognitive, emotive, behavioral and biological functions including emotional behavior and long-term memory often necessary for emotional behavior to occur. It is NOT essential for you, the reader, to know the names and functions of these structures – although it could benefit you. Knowing that there are anatomical, electro-bio-chemical and hormonal correlations between your emotions and your brain is, however, critical to improving your emotional intelligence. Although you may decide not to know these structures, you will have to remember, at minimum, where your emotions live. Your emotions live in your head. More specifically, your emotions are an expression of your thoughts. Without thought, you would have no emotion. If you wish to change your emotion, you will have to change your thinking. The limbic neighborhood, when in balance, can be described as resting. While at rest, however, it can be instantaneously energized by thought and perception in an all-out effort to protect the body from real or perceived harm or the threat of harm. The stress response will cooperate with your thinking and automatically release neurochemicals and hormones into the bloodstream that are intent on providing the fuel you will need to protect yourself from real or perceived threat. You can expect a sudden increase in heart rate, perspiration, flushing of the skin, hair standing on end, etc. All designed by Nature to give you the strength, energy and focus to run away very quickly, fight very bravely or just to freeze, motionless, in the hopes you will appear unthreatening to your attacker. Let’s find a more familiar image to understand this phenomenon. Imagine that you have a paper cut. Blood flows from the cut, no matter how much you are against that from happening. It is an automatic response to injury. You can commit to do something about the cut by attending to it. You might wash it, put it in your mouth or cover it with a Band-Aid (or plaster). Your effort to stop the bleeding will likely shorten the time the wound is active and susceptible to infection. While attending to the cut, you commit to memory how the accident occurred and tell yourself how to avoid similar injuries in the future. Injury and trauma are, in many ways, opportunities for learning. But how does cutting your finger and attending to it compare to the expression and remediation of emotion? Improves the ability to focus on the task of determining the location of the threat and how to respond to it. Much like cutting your finger, there is an automatic flow of neurochemicals and hormones into the bloodstream that happens without your consent. Similar to tending a paper cut, you can be a passive observer or you can actively respond by providing wound care. You can put a Band-Aid on your emotional injury. Here I will provide you with some self-care techniques and suggestions. First, it should be noted that if the injury to the emotional areas of your brain were visible – if the flow of neurochemicals and hormones rushing here and there inside your head could be observed, rather than having it all happen deep inside your skull, you may be more active in responding to it, without all this comparison to a paper cut. Instead, we will just have to imagine and increase our awareness of the phenomenon. An Automatic Protective Response Results from Thinking: Your threatening thoughts instigate the flow of neurochemicals and hormones into your bloodstream, causing your body to go into a protective mode (a stress response). These chemical will flow for some period of time specific to you. The longer you ruminate about your perceived threat, however, the longer the chemicals will remain flowing through your bloodstream. It could be minutes, months or even years (chronic stress). If you do not tend to the wound, you will be susceptible to infection, fatigue and a continued loss of homeostasis and likely reopen the wound each and every time you encounter the same or a similar misfortune. Interfering with the Flow of Neurochemicals and Hormones: Using more rational thought is the essential part of attending to the emotional wound. It is also the first step toward improving emotional intelligence. The fact that the hormones and neurochemicals are already in your bloodstream will present some problem. Although you may be thinking more rationally, your physical body will need time to readjust and return to balance. Be assured that these hormones and neurochemicals will dissipate, if you stop them from flowing using more rational thought. Your new thinking will eventually win over the process and you will be free of these toxic substances. At least until you encounter misfortune, again – something you can certainly expect. To encourage the return to balance, you may breathe deeply, stimulating your vagus nerves. Breathing deeply (through your mouth, into the pit of the stomach and out your mouth) sends a message to the brain that all is well and that it is safe for the body to return to balance. The next time you encounter some perceived danger or harm, try these techniques and suggestions. How did it work for you? Would it help to keep the suggestions in your purse or wallet, for when you find yourself in the middle of misfortune and want a quick guide? Michael Cornwall, PhD is an author, lecturer, clinical supervisor, educator and child behavior therapist in private practice. In our community, you may know him as the author of blog, Emotional Intelligence Theory. This entry was posted in self care and tagged anxiety, brain, emotion, Limbic system, trauma. Bookmark the permalink. I think there is a great deal of efficacy for the employment of biochemical nutrition as part of the overall application of orthomolecular medicine. These alternative therapies should replace traditional medicine’s addictive pill therapy if there is even a slight chance of improving mental health. if we can ONLY get the word out . . . i would be happy with any “tradition” in mental health therapy that wasn’t so traditionally random . . .
How did you know its been tough at work the past few months, especially the last 2 weeks?! Ha! I love love love what you have written and how concisely you have explained everything! I didn’t learn thought, emotion, behavior, action until my late 30’s. Darn I wished I had been taught that in school. At 50 now I can look at things fairly objectively, and decide what I can learn from each situation and how I choose to respond as opposed to react. Lots of messages coming to me today about letting things “die a natural death” and moving on from thought processes. God always brings what I am to have. I was blessed to mountain bike with my husband in the mountains with the rivers and snow capped peaks and the deep forest around us and my sense of love and joy and wonder is massive! I love the world and my life and all those around me. I am saturated in green and we can heal and have this flow our bodies just like all the other hormones when times are tough. I have been very much attacked at work lately and it has been tough and I know its not me as much as others opinions which they are welcome to – “What others think of me is none of my business”! That is the message that was sent to me earlier. I love how our messages come in blocks and reaffirm in so many areas. The people causing problems are fear based and in their own thought loops, and its just can make it tough sometimes. What I know for sure is I can say no thank you and I am not participating any more in any of it. That is a blessing too! thank you col! it seems that every time i make a presentation on this material everyone in the audiance has an ah ha moment . . . thank you for your encouraging words! LOve this! Thank you! I’m going to pass it on.